The purpose of the Mental Health Practice in a Digital World: A Clinicians Guide book is to prepare clinicians to understand, critically evaluate, and embrace well-designed and validated technologies that have the potential of transforming the access, affordability, and accountability of mental healthcare. The reader will become aware of the practical applications of technology in mental health as well as research supporting information technology tools, policy debates. Each chapter contains either examples or scenarios that are relevant to the current practice of mental health care. Policy makers, application developers, scientists, and executives that have lead or supported the use of technologies in real world practice are chapter authors. 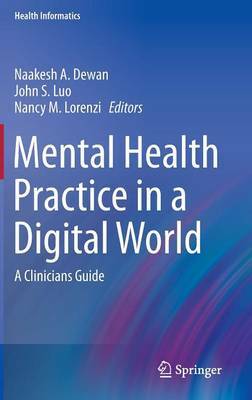 The goal for this book is to be the key resource for current and future mental health clinicians in the U.S. and around the world to become familiar with technology innovations and how they impact and improve clinical practice.